[SatNews] Thales has been selected to supply and operate the European Union Force (EUFOR) with a highly secure communication and information system in the Central African Republic. 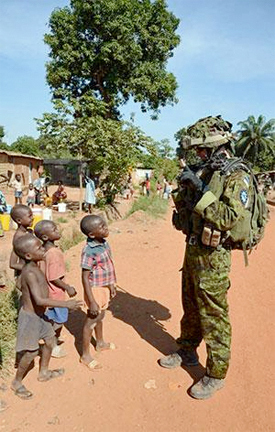 Photo is courtesy of the Public Affairs Office for OHQ EUFOR RCA. The system deployed and operated in theater by Thales in the Central African Republic employs a wide range of technologies, including SATCOM and point-to-point PMR radio links, fire-optic links, secure voice over IP (VoIP) and video on demand. All of these services are available simultaneously and can be implemented quickly, enhancing operational value for forces in the field. The system also provides data storage and back-up for users and military applications. Complex combinations of transmission solutions are required to meet the broad spectrum of operational situations encountered on this deployment, which increasingly call for data and video services as well as voice. The contract covers three deployment phases. The first phase, involving the provision of secure communication services between chiefs of staff and in-theater units, was completed in April. The second phase is now underway. Thales will equip EUFOR’s two points of presence in Bangui as well as the European command headquarters in Larissa, Greece. The Central African theater network is connected to Larissa via a SATCOM link, also supplied and operated by Thales.